The file format I used is WMF - Windows Metafile Format. Nearly all Windows programs can import it (e.g. WINWORD, EXCEL, AMIPRO, CorelDraw...). Many people just use simple relais to switch the bulb current. This plan is from the french light described at another page. 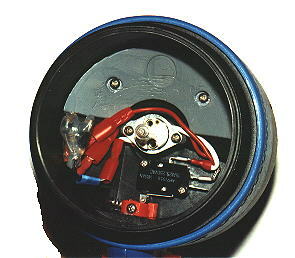 ILS is a reed contact. Because the current is very high in the switching phase that means a hard time for the bulb. 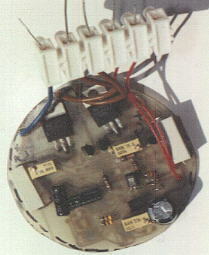 The first circuit which handles that I found in the magazine elrad 2/89 (only in German, with circuits). My circuits are similar to this one. 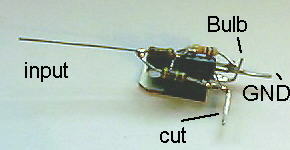 The halogen bulb is switched by a MOSFET transistor and stays connected to the battery voltage. If the reed contact is closed, the rest of the circuit gets power. The voltage controller IC 7805 supplies the supply voltage for some ICs and the reference voltage for the comperators. The modul "AccuCheck" contains 2 comperators which set a signal if the battery voltage sinks below a certain adjustable value. The modul "Warning" shuts off the light in regular intervals to warn the diver. If the voltage drops even more the signal "OFF" is set and the light switched off. The modul "Storage and Flash Signal" generates the flashing signal and stores the occurence of "Warning" and "OFF". That is necessary because the battery voltage rises if the light is switched off, and the light would be switched on again. The modul "OP and MOSFET Current-Control" is a switchable, adjustable current source, which limits the current to 1,5x of the nominal value. The simplest and smallest circuit I use is not much more than a relais with a current control (picture) (circuit-WMF-Format) (all WMF-files as PDF) (GIFs of the Layout). It is smaller than most relais and can switch up to 4A, with a cooling device perhaps more. One version is slim and has parts on both sides. The other one is wider but narrower. There is a possible variation to this and the following circuit. If you want to decrease the voltage drop across the MOSFET and therefore the temperature rise, too, you can put a second MOSFET in parallel to the first one. You connect the pins with each other; that's easyily accomplished as piggyback(?). To be absolutely on the safe side you could use seperate GATE-resistors. To adjust the higher current (>7A) it's necessary to change the resistors at the (+) input of the comparator or put another 0,01Ohm resistor in parallel to the first one. Look at these improvements, too. The more complicated circuit contains the current control for two bulbs and a two-step voltage control for the battery (circuit-WMF-Format) (all WMF-files as PDF) (GIFs of the Layout). I prefer lights with two switchable reflectors. All these diodes are necessary to control both bulbs with one seperate reed contact without affecting the voltage control. Only the modul "OP and MOSFET" needs to be in duplicate. If you need only one bulb you can use this version (circuit-WMF-Format) (all WMF-files as PDF). Attention !!! I'm sorry but there is an error in the circuits, which can lead to problems with reed contacts. Connect a resistor of about 10 Ohm in series with D1 (the diode which feeds the big 470uF capacitor C1) or if you can't get there in series with L1R1 and L2R1 (switching inputs). If that't not the case there will be a high load current to the capacitor when switching on, that may lead to a "glued" reed contact. You may exchange the BUZ 11 against a BUZ12AL, which has a lower On-resistance. Another improvement can be achieved by putting a capacitor of 47nF (10-100nF) between GATE of the MOSFET and ground. You won't see a difference in use, but the current waveform during the current-limiting-phase will be much smoother. If you are using a PWM dimmer, too, the capacitor should have only 4,7nF. This circuit will draw about 35mA of current. This circuit is used to dimm the output current if one of the pins PWMx is connected to 12V. It can easily be added to the circuit above. 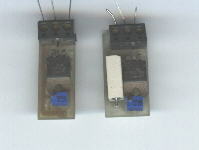 The transistor can be almost every NPN type (e.g. BC547). One application is the connection of a 12V bulb to a voltage source with 14,4V (12x NiCds). But be sure to measure every voltage drop before using a dimmer. E.g. my 6th accumulator with 12 cells should have 14.4V theoretically. When connected to a load there are only 13.8V left due to cables and inner resistance. At the lighthead there are only 13V, which is just right for a normal halogen bulb. Even 14.4V would work. HLX bulbs for 12V do just the same. But be sure not to connect HLX bulbs to 14.4V, which would destroy them. This circuit will draw about 30mA of current. b) a modular system based on a switching unit with current control and additional modules for voltage control, SOS, dimmer, seal break report and so on. Of course it is possible to use the circuit with a switch in the main current way (right picture). The BUZ11 is capable for up to 4A/50W. A higher supply voltage also shouldn't be a problem. 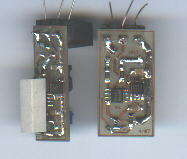 The construction was done in form of a "hedgehog", which means the parts are mounted directly and with few space onto the MOSFET. Everything is covered with hot glue for isolation. So everything fits into a KSS plug from Devpein. Here is a detailed plan how to build it. MOS-FET (Q1) Capacitor(1uF) with plus pole left PNP Transistor with flat side down, Basis upwards. Resistor (R1) from GND to Basis. R2 from input to Gate (cut afterwards). This is the finished circuit with cables, isolated with hot glue and built into a Mares Arturo. This is an addition to simple 6V lights. If you use a zener-diode ZD with 3,3V you get a cut-off voltage of about 4,3V and a hysteresis of about 0,8V. 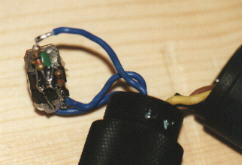 The 6V high current relais takes the place of the resistor "Relais". If you adjust the zener diode the circuit should work with 12V, too (R1 will be 3.3kOhm). The type of the ZD is irrelevant. Use any standard NPN transistor for Q1 (e.g. BC547). V1 is the battery voltage after the main switch. If the relais oszillates before switch-off a capacitor of 47uF (10-100uF) between basis and emitter of Q1 might help. Attention ! This circuit won't warn you before switching off !!! That is a 6V 7Ah light from Multitec. When I bought it used, not working at a diving base, the electronic was some prototype rubbish, which had seen at least one short circuit. Same for the charger which I didn't used. 2 of the 5 cells were still working. So I got new cells, changed the charging connector and built a new control circuit. At the inside there is a reed contact directly at the PCB, at the outside a magnetic leverage with only one position. I wanted to build a uC controlled circuit anyhow, so this was the chance. 6V System(1), the uC should work below 5V because the voltage can drop under load. Only one switch position, but I wanted a dimmer. After first switch on the light goes to maximum brightness. If I switch the lever to OFF for a short time(~100-500ms), the first dimm position is used without switching off between. 2 times switching off gives the second dimm position, more or less only an emergency light. 3 times -> SOS Mode. The last two stages won't switch off when the battery goes down. My first try had problems when the voltage dropped, so I had to add another chip. The circuit is working now, but it is not as simple as I intended it to be, so there are no plans until now. This simple circuit is useful if you want to charge an accumulator from a car battery. output current: max. 0,5A (with appropriate cooling up to 2A). If you need an inexpensive charger for lead-acid batteries, it is not necessary to build everything on your own. 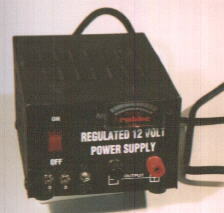 There are a lot of power supplies available which are prepared to give a voltage of 13,8V (for CB radios for example). Most have current control already. That would be enough to charge a 12V lead-acid battery. mostly there is a potentiometer on the printed circuit board to set the right voltage (see accus). The current is controlled with the help of a power resistance which is easy to find. If you change it (only larger) by switches you can charge batteries with different capacities, perhaps even NiCds with constant current. You can add a cheap amperemeter if none is built in to monitor the charging status. 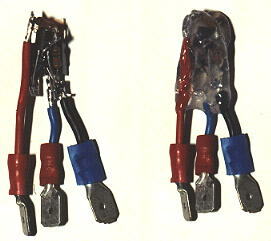 With some know-how it is possible to add switches for different voltages for batteries with built in diodes and others. 6V-usage isn't possible by this way. I'm working on a charger especially for lead-acid batteries and travelling. (Yes I know there are some around right now! ), which serves exactly my demands. As small as possible. Switching power supplies would be fine but building one is very complicated. Their advantages are not so relevant with this voltage/current characteristics.